Just a few weeks ago, a new Toho movie theater opened up in Shinjuku, Kabukucho, Tokyo. 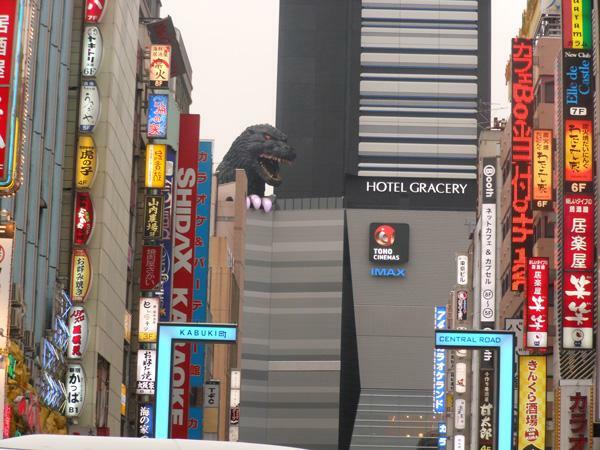 This theater has a huge godzilla statue on top of it that from some angles across the city, looks like godzilla is taking over Tokyo (just like many people have been so patiently waiting for ^^). The other week I went with some of my friends to see a movie in IMAX 3D. Before entering I had prepared my friends for the IMAX experience, they had never been to an IMAX screen before so they didn't know what to expect. I remember IMAX being so big that it would hurt your eyes if you were too close to the screen. I had assumed IMAX would be the same size in Japan. Growing up in the west I guess you could say I have a strong expectation for "big screens". The movie culture in Canada compared to Japan is substantially larger. I was not only let down at the size of the screen, I felt cheated out of money :( I mean, the threater was nice and the chairs are comfy and all. The screen was slightly bigger than a regular theater screen, but It wasn't anything a north American should expect for IMAX size. It also costs more (just like in Canada), which made it even worse. Movies in Japan are more expensive than Canada as is, average between 15-20$ per person. The IMAX was almost 30$. As a friendly suggestion and warning. Don't expect a huge huge huge screen. Since the theater was new, the staff were SUPER friendly. You could really feel the energy inside the theater. I also should note I went at 9am (yeah, weird time to see a movie right haha). Even though we went at 9, it was still packed!! (new things tend to pack up fast in Japan). The staff greeted us outside the theater, the top of the escalators up the theater and when we were going to get popcorn they all were overly friendly and enthusiastic about the new customers in the new store. Wow, that is very expensive for some quick entertainment! I'll probably end up visiting a movie theater in Japan, when I get a chance to visit one day. Can someone answer this question: What type of movies can one expect at a Japanese movie theater? Is it only like Rom-Com or do they have everything from (this is an example) animation to action films? I just wanted to thank you for sharing your thoughts and feelings, problems and other stuff with us. Your somehow an idol for me now. About one and a half year ago (or maybe two) I just founded your YouTube Channel and I thought that you're a really funny/nice person so I watched another video of you and then another video and then another video an so on, and so on… now I'm already somehow addicted and I have to tell you: Thank you! Thank you for being you, thank you for making me smile, thank you for uploading videos and also thank you for telling us about your life and about Japan. I'm so happy that you exist and I want to say that I'm happy that your just the way you are.